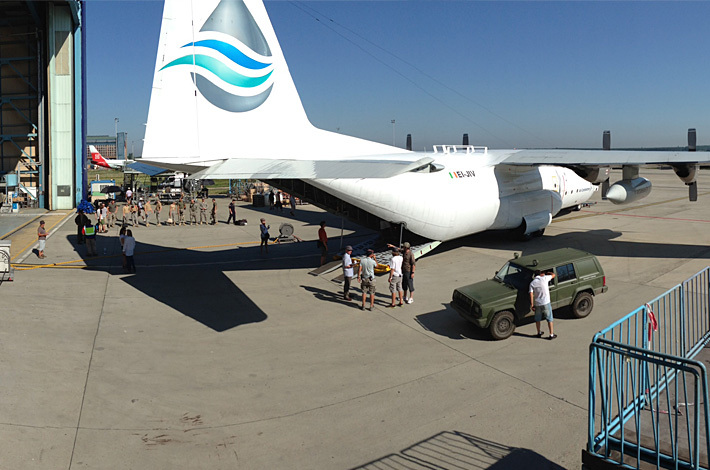 The Air Contractors Hercules EI-JIV once again became a film production star when it was flown to Budapest for 4 days to be used as a focal part of filming for the 4th series of the Sky drama series “Strike Back”. The plot features jeeps, guns, villains and goodies and of course the Hercules, which takes centre stage for some interesting chase scenes on the runway. This is a must see role for EI-JIV and work continues on securing the next big part hopefully for a Hollywood blockbuster. Strike Back is a British action and military television series, based on a novel of the same name by novelist and former Special Air Service (SAS) soldier Chris Ryan. The series follows the actions of Section 20, a secretive branch of the British Secret Intelligence Service (MI6), who operate several high risk, priority missions throughout the globe. ASL Airlines (Ireland) Limited formerly Air Contractors (Ireland) Ltd.